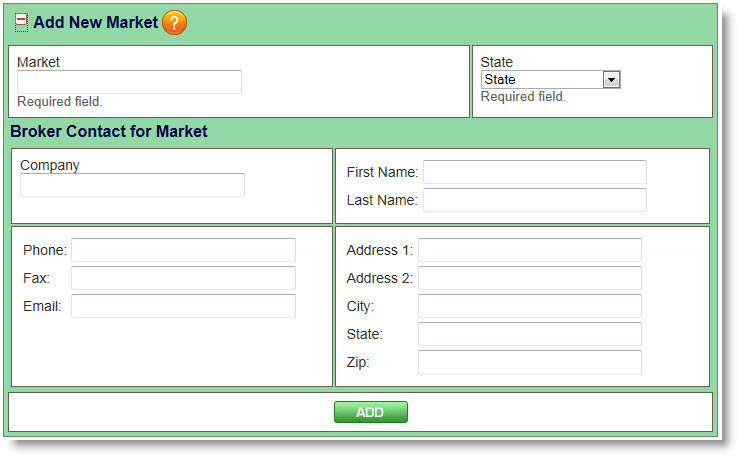 When creating your Market, it is recommended that you use a generic name that incorporates all cities that you service. We suggest that you use only one market UNLESS you have branch offices that utilize separate staff to serve each office. If your market area includes several cities in close proximity, we still recommend ONE market in your system to streamline efficiency. Once a Market is added, it cannot be deleted from the system. It can be renamed, however, by clicking on the + next to the desired market and updating the information. Upon activation of your website, one market will already be created. This is based on the city information that you provided when you registered. 2. Click on the + next to Add New Market. 3. In the Market field, add the Market name. 4. Select the State from the State drop-down box. 5. Provide information for the Broker Contact.